Sporting a bright red-and-yellow dewlap under its chin, the color-changing Bahamian anole lizard is a popular exotic pet. This wily anole has escaped captivity on enough occasions to successfully invade large areas across the Western Hemisphere. At first glance, this suggests that the anole is well-suited to adapt to a changing climate. But a new study led by a Smithsonian researcher, suggests that may not be the case. Michael Logan, post-doctoral fellow at the Smithsonian Tropical Research Institute in Panama, studies the brown anole in its home range in the Bahamas. His most recent study shows that the anole's genetic makeup is surprisingly ill-suited to future climate scenarios. The anole is therefore unlikely to adapt fast enough to keep pace with current rates of environmental change. The findings, published May 9 in Proceedings of the Royal Society B, have important implications for the future of cold-blooded species (such as other reptiles, amphibians and fish), especially since rapid evolution is considered a key way for many of these species to survive a global increase in temperatures. "Brown anoles have huge population sizes and therefore should have loads of genetic variation in most traits, permitting rapid adaptation," Logan said. "Instead, we found that genetic variation in several traits that are critical under climate change is basically zero." Brown anoles are ectotherms: they rely on the temperature of the environment to control their body heat. When they are too cold, they shuffle off to a sunny spot and soak up heat. When they are too hot, they seek shade or cooler spots. Maintaining an optimal body temperature is a basic component for success at essentials of life—moving, eating and reproducing. 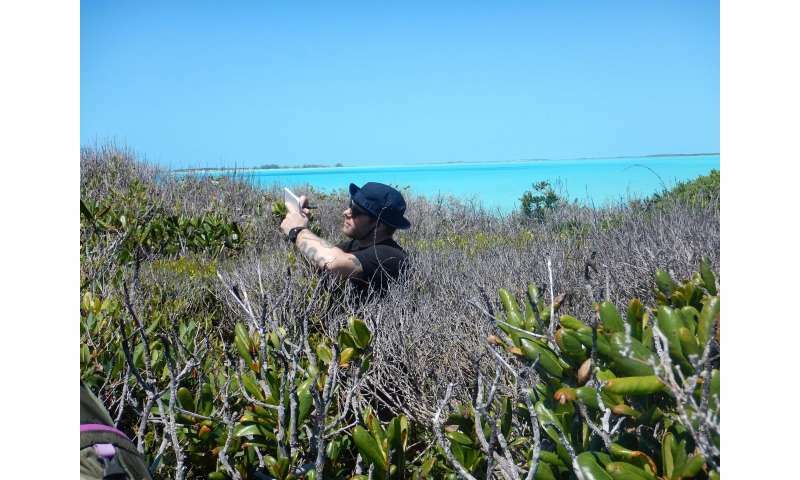 For the study, Logan and colleagues captured brown anoles from two different, isolated habitats in the Bahamas. One is relatively cool and forested; the other is a hot, sun-soaked peninsula. In laboratory conditions, they raised hundreds of offspring from these two populations and, after they reached adulthood, challenged them in some simple trials. 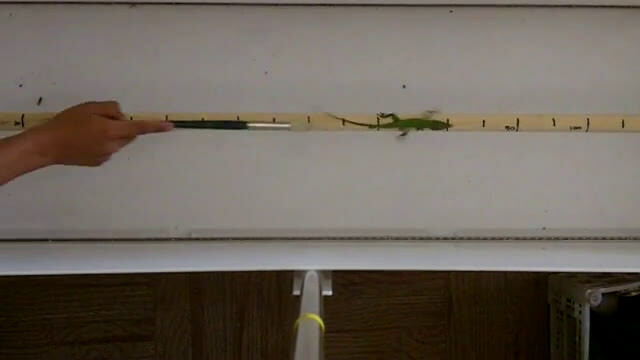 To evaluate physical performance at different body temperatures, they used a high-speed camera to film the lizards as they ran across a wooden dowel rod. To better understand how they behaved when exposed to environments of different temperatures, they used gel packs and heating lamps to create an environment that ranged from 20 degrees C to 48 degrees C and recorded where the lizards moved and how they adjusted to changes in temperature. To understand the offspring's inherited traits—and thus evaluate their potential to evolve—they ran a series of analyses. The results surprised across the board, especially since the different lizard populations had long been isolated in highly contrasting environments. 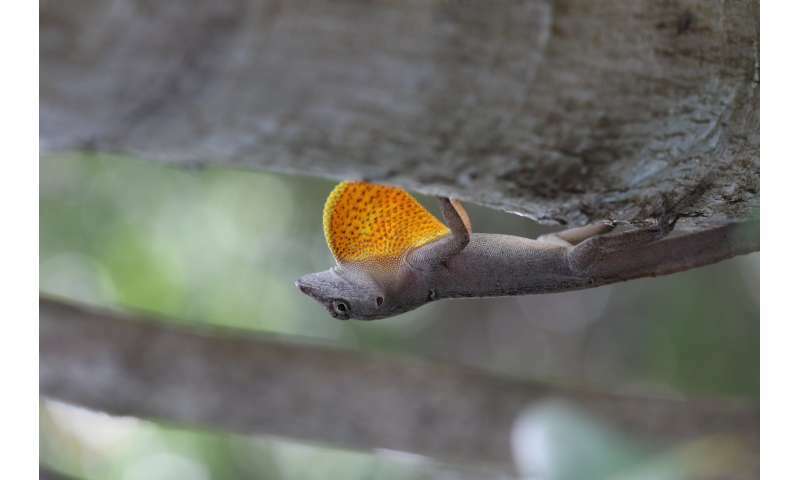 While the researchers found some evidence that the populations were adapted to their local environments, genetic results suggested the lizards have little built-in capacity to inherit traits that would allow them to evolve apace with climate change. One possible explanation is that strong selection pressure in the past, which caused them to be adapted to different environments in the first place, eliminated future genetic variation that may be required. "If genetic variation in thermal traits is rock bottom for a species like the brown anole that has huge population sizes and a super-wide geographic distribution," asks Logan, "what will it be for most other species that typically have much smaller population sizes and live relatively isolated, specialized lifestyles?" With most of the same genes, how do lizard siblings end up so different?